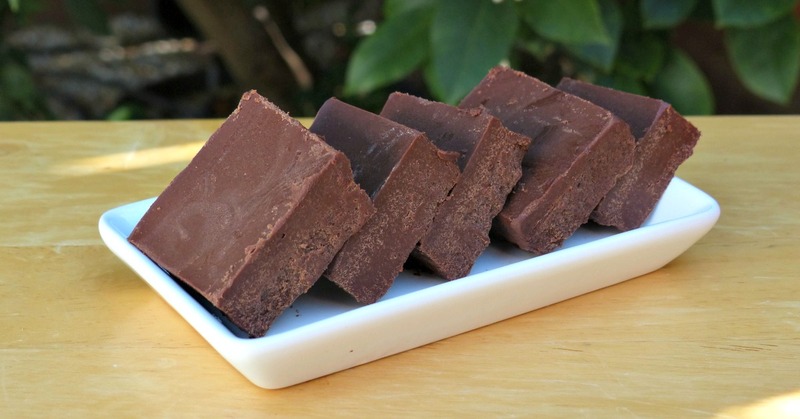 This easy coconut oil fudge is a variation on my dairy-free fudge made with cocoa butter. Personally I love the extra chocolaty richness that you get when you use cocoa butter, but I know not everyone wants to track down that somewhat unfamiliar ingredient. So I decided to come up with a coconut oil version. If you don’t like the flavor of coconut, you can try using refined coconut oil instead of virgin coconut oil. I haven’t tried this myself, though, so can’t comment on whether you might also have the adjust the amounts of the other ingredients. I usually make a double batch of this, since it keeps so well in the freezer. Want to See Me Making Coconut Oil Fudge? Immersion blender: I highly recommend using an immersion blender to ensure that the honey is thoroughly emulsified with the other ingredients. You CAN do this in your regular blender or even food processor, but I like using my immersion blender because it means I have fewer dishes to wash. (Fewer dishes is pretty much one of my life goals.) I have this this immersion blender and have been very happy with it. Now, Onto the Coconut Oil Fudge! Once the coconut oil is melted, remove from heat. Add all other ingredients and use your immersion blender to mix. If at any point the mixture becomes too thick to mix, return it to the stovetop and gently heat until it's liquid enough to work with. Pour fudge into your prepared pan, then transfer to the fridge to cool. If you want to speed up the process, you can also cool in the freezer. 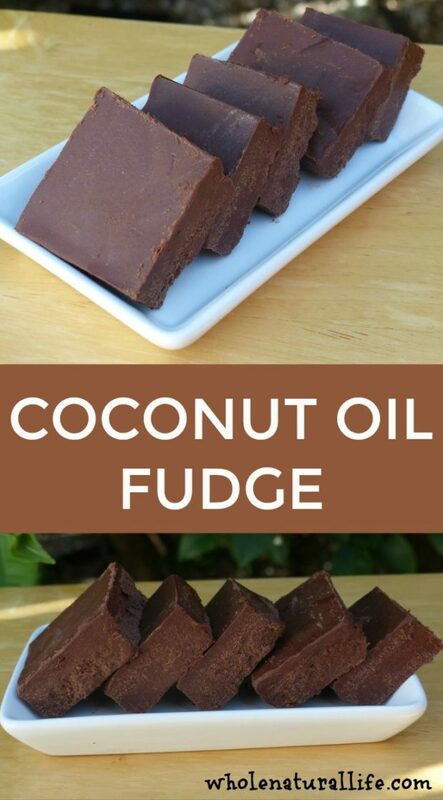 Store finished coconut oil fudge in a lidded container in your freezer. I have to admit I'm concerned that you are saying that this is a GAPs diet appropriate food. It is not. Cocoa/chocolate/carob - none of it are allowed on GAPs. When I was on the GAPS diet in 2011-2012, cocoa powder and cocoa butter were both allowed as long as you didn't have any digestive symptoms, and as long as you tolerated them well. Has that guideline been updated? That aside, though, I didn't actually say that this was suitable for GAPS. Where did you read that? Is there a reason you keep them in the freezer and not the fridge? Will they go bad if left in the fridge? When you eat them out of the freezer, are they frozen solid, or just really cold? I'm excited to try this recipe for Valentine's Day treats around the house. I think I have all the ingredients Cheers! Hi Beth, I keep them in the freezer because the coconut milk in this recipe is perishable. If kept in the fridge it will go bad after a few days--but in the freezer it stays good indefinitely. The coconut milk that I buy says to consume within 2 days of opening the carton. I routinely let it go four or five days without any issues. So if you're going to eat your fudge within five days or so, feel free to keep it in the fridge! We never go through it that fast (especially since I usually make a double batch), and I just don't want to have to remember if it's still good, so I just store it in the freezer from the start. Oh, and the texture out of the freezer is mostly just cold. It's definitely frozen, but it's not hard; it still has a traditional fudge-like texture. I hope it turns out well for you! Happy Valentine's Day! I have made this recipe twice now and I must be doing something wrong! It tastes very grainy..not smooth as it is supposed to...what am I doing wrong? Hi Jill, Hmmmmm. I've made this recipe many times and I've never had this happen. Are you sure you're using the right amounts of all the ingredients? Is it possible that you're using coconut BUTTER instead of coconut oil? Those are the only things that come to mind that could make your fudge grainy. Maybe you could describe exactly how you're making the recipe? Please let me know what you think--I'd like to help troubleshoot this with you! Hi Jill, Thanks for replying. :) You're using cocoa powder, right? How are you mixing everything together? Are you using an immersion blender? cocoa powder yes..immersion blender,no. Just a hand mixer...that could be the problem?? Well I am going to try it again using the blender as you suggest...I will persist since this is such a great recipe! Thanks for your input. It worked! I was not using Virgin oil so I changed that and put it into the blender. Delicious. Thank you for your help! Can canned coconut milk be used ? Just confused on the type, or the drinkable kind nextbyo the almond milk on the refrigerator section? Yes, you can definitely use canned coconut milk. The kind I used is like canned, it just comes in a tetrapak instead of a can. I wouldn't use the refrigerated drinkable stuff. I used the coconut milk in a carton from the refrigerator section and it came out fine. Do you have the nutritional information on this? Calories etc...? No, I haven't calculated that. I'm sure you could look it up, though! I haven't tried either of those substitutions but I think they would work. I've never worked with erythritol so I'm not sure what that's like. If you were to use some or all stevia, I would consider also adding more coconut milk to compensate for the reduced liquid from leaving out the honey. This is my kind of fudge! You can use either. I find that they work interchangeably in my recipes.